Almost everyone reading this has perused Google’s collection of satellite images, either on Google Maps or with Google Earth. Perhaps you’ve wanted to get a bird’s eye view of your own home or visually traveled to some far away political hotspot. But one place you haven’t easily been able to travel via satellite image — back in time. At least, that was the case until recently. Last Thursday, to be specific. 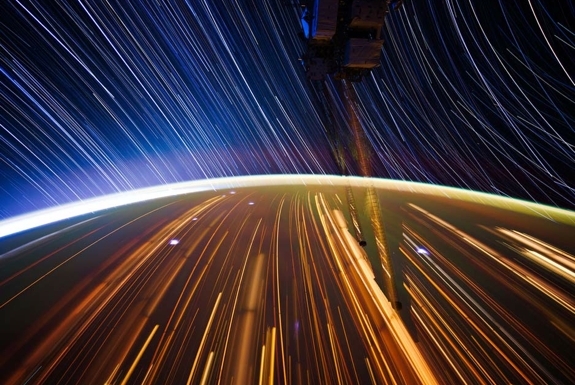 That’s when Google — together with TIME Magazine, NASA and the U.S. Geological Survey — launched Timelapse, a zoomable, interactive web tool that lets you easily compare satellite images taken between 1984 and 2012 of nearly any location. Google declared their Timelapse project to be “the most comprehensive picture of our changing planet ever made available to the public.” Spot Cool Stuff declares it to be the most terrifying. Seeing the impact humans have had on our planet in less than 30 years is stunning. And not a bit mesmerizing. Consider the retreat of the Columbia Glacier in Alaska . . .
. . . the deforestation of the rainforest in Brazil . 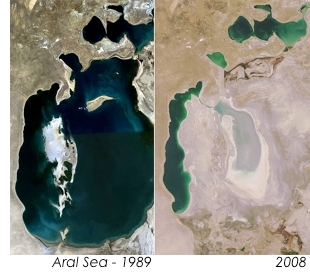 . .
Another high profile example: the Aral Sea (now the Aral Seas) located between Kazakhstan and Uzbekistan. What was the world’s fourth largest lake not so long ago is today a collection of over-sized puddles. A dam might save the very northern part of the “sea,” but if you want to see the rest before it completely dries up you’d better stop reading this immediately and book your flight to Tashkent. (Not incidentally, the saga of the sea is told in the wonderful book The Devil and the Disappearing Sea: A True Story About the Aral Sea Catastrophe). Very interesting GIFs. Like to get this kind of info to see how globalization change our world crazily. 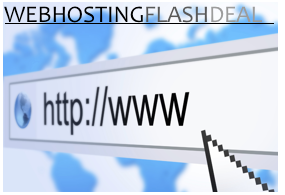 High Quality website hosting for $3.50/month! JustHost offers excellent uptime and support — on sale!